From his bid to become Eudora Welty's lawn boy to the time George Plimpton offered to punch him in the nose, lineage has always been important to Rick Bass. Now at a turning point--in his midfifties, with his long marriage dissolved and his grown daughters out of the house--Bass strikes out on a journey of thanksgiving. His aim: to make a memorable meal for each of his mentors, to express his gratitude for the way they have shaped not only his writing but his life. The result, an odyssey to some of America's most iconic writers, is also a record of self-transformation as Bass seeks to recapture the fire that drove him as a young man. Along the way we join in escapades involving smuggled contraband, an exploding grill, a trail of blood through Heathrow airport, an episode of dog-watching with Amy Hempel in Central Park, and a near run-in with plague-ridden prairie dogs on the way to see Lorrie Moore, as well as heartwarming and bittersweet final meals with the late Peter Matthiessen, John Berger, and Denis Johnson. 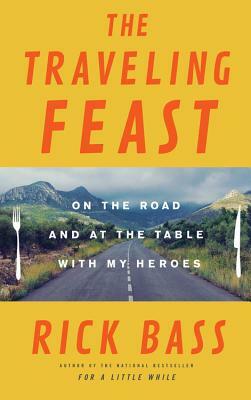 Poignant, funny, and wistful, The Traveling Feast is a guide to living well and an unforgettable adventure that nourishes and renews the spirit. Rick Bass, the author of thirty books, won the Story Prize for his collection For a Little While and was a finalist for the National Book Critics Circle Award for his memoir Why I Came West. His work, which has appeared in The New Yorker, The Atlantic, Esquire, and The Paris Review, among many other publications, and has been anthologized numerous times in The Best American Short Stories, has also won multiple O. Henry Awards and Pushcart Prizes, as well as NEA and Guggenheim fellowships. Bass lives in Montana's Yaak Valley, where he is a founding board member of the Yaak Valley Forest Council.